When I first made the move to a DigitalSLR I deliberately bought a cheaper camera - a Canon Rebel XTi/400D. I did this partly to put more money to lenses, but also becuase I knew that technology would move on and I'd be looking to replace the body in a few years. I got the itch this year, and was sorely tempted by the Canon Rebel T2i/550D. It seemed to be almost the quality jump that would make me get my credit card, but not quite. As I considered the purchase I felt that I needed something more before I'd make the jump, and one something that would make the difference was a articulated screen for live view. Serious photographers tend to dismiss the importance of an articulated screen, saying that it's only worthwhile for video work. But while I use the viewfinder for 98.37% of my shots, from time to time I find shooting angles that are just too awkward or impossible to do. 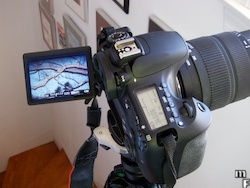 So when I saw the Canon 60D announced, finally getting the articulated screen, I knew I wouldn't be able to resist it. I bought it the day after I read that Apple supported its raw format. The biggest suprise plus for me is (ironically) the viewfinder which is much brighter and bigger. I've probably got more enjoyment out of that upgrade than anything else. The overall feel and ergonomics is much better than the 400D, but fortunately the weight isn't much more. Some people bemoan dropping the magnesium body from the 50D, but I'm happy with a lower-weight option. I'm not a heavy flash user, but really like the fact that I can use the 60D as a master. This allows me to easily play with moving my speedlight off-camera for nicer looking flash photos. And yes, the articulated screen gets very occasional but very much appreciated use.